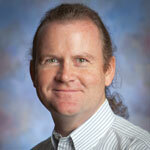 Featured Speaker: Dr. David Nice, Lafayette College. "Using Millisecond Pulsars to Probe Einstein's Spacetime"
Millisecond pulsars are extreme astrophysical objects. They are more massive than the Sun, yet they are small enough that they could fit between Radnor and Center City. They rotate hundreds of times a second, faster than a kitchen blender, while emitting lighthouse-like beams of radio waves. I will describe our observations of millisecond pulsars using the radio telescopes at Arecibo, Puerto Rico, and Green Bank, West Virginia. I will show how we use these observations to explore phenomena predicted by Einstein's theory of relativity, including the warping of spacetime around massive objects and the emission of gravitational waves by accelerated objects. I will describe how this work complements the recent detection of gravitational waves by LIGO.